Suki Chan's films are notable for their dream-like aesthetic. Shifting between the micro and the macro, she draws the viewer into a cinematic âelsewhere'. Her two major film pieces, Interval II and Sleep Walk Sleep Talk, explore our physical and psychological experience of place. Interval II juxtaposes a ruined pier in Northwest England with a rammed earth roundhouse in Southwest China, while Sleep Walk Sleep Talk probes the delicate balance of freedoms and restrictions in contemporary London. Questions of cultural identity permeate Suki Chan's practice. 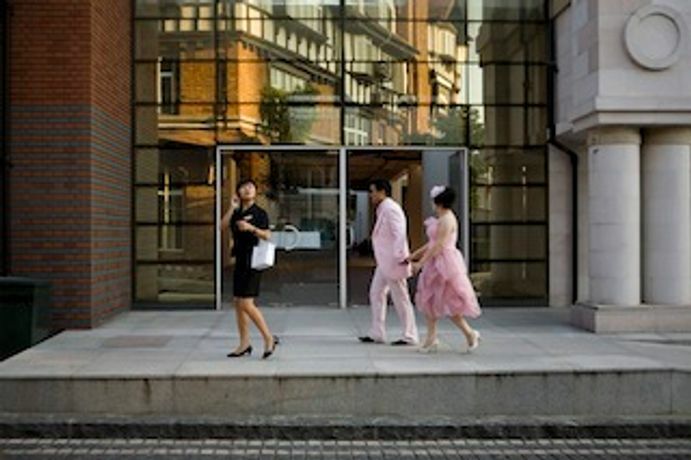 A Place on Earth, is a series of photographs of new towns in the suburbs of Shanghai. Chan's interest is in the way people seem to be moving towards an idealised image or identity, yet the journey is fraught with tension and repressed anxiety. The Story of Rice, a multi-media project that Chan created in stages between 2003 and 2007, maps people's subjective perceptions of rice through stories, slogans, proverbs, songs, sayings, poems and drawings. Chan had images made in neon, a material that she was drawn to because of its associations with cities in the East as well as Chinatowns in the West, themselves a kind of fabrication. A publication accompanies the show with a foreword by Gareth Evans, writer, curator and co-editor Artesian magazine. Suki Chan will be in conversation with Gareth Evans 8th Dec at 7pm (at the gallery). Suki Chan was born in Hong Kong and lives and works in London. She graduated from Goldsmiths in 1999 and completed an MA in Fine Art at Chelsea School of Art in 2008.